There is a way of thinking about life that, after my educational media songwriting gig in the aughts, might say something like: hey, Jeff, dude, having had some rewarding experiences and even a little monetary success, maybe you should chalk it all up as a win and let go of this whole songwriting thing? To which I say, no thanks. I’ll concede that (a) creative projects involve hard work and (b) it is great when your creative work generates any kind of external success. So why would you keep doing that work with little expectation of reward? Because it’s also true that exercising your creativity is beneficial in and of itself. The work is worth it, even without acclaim and/or money. It wakes your brain up. Your soul, too. It’s a way of being in the world, and that can be a beautiful thing. If your life is a car engine, doing creative work can be like gunning it on the freeway: it not only feels good, it’s also a way to blow out some of the accumulated gunk and get things running more smoothly. So, in recounting my path in songwriting, we’re up to this decade now, and the main things going on for me and my wife Tonie have been balancing our careers (for me that’s corporate writing) with a busy and satisfying (and often challenging) family life. At one point, we had five kids at home, going to five different schools, ranging from elementary school to high school! And yet all that time I was still playing guitar and occasionally writing songs for fun. And then way led on to way, like it do. We used to camp regularly with my youngest son’s YMCA Adventure Guides group, and I started doing storytelling and campfire song-leading in that context. One of the coolest things about this is that my friend Quentin Thomas-Oliver, violist extraordinaire and evil genius behind Ponytrap, would often add a semi-improvised viola score to the stories, and join in on the songs. This was hugely fun and popular, and provided momentum. I wrote a new campfire-style audience participation song, “Ordinary Day” (maybe one of the best songs ever written about the misadventures of a fire-sneezing pig). In my little microcosm, it was a hit. This was all so energizing that it boosted my appetite for more, and we started hosting a lot of musical get-togethers, still a regular and energizing thing. 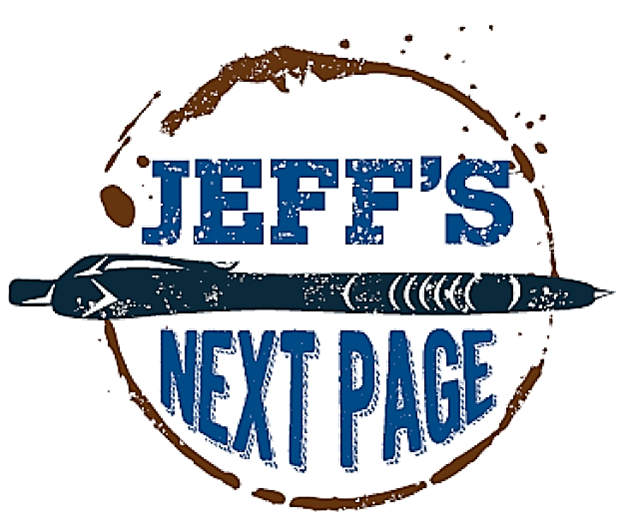 My ability and confidence as a singer and player crossed some threshold, and, here in my fifties, I decided to launch this blog to talk about my creative projects in a broad sense, and began to perform and record my original songs, publishing them on my youtube channel, Jeff’s Next Page. It’s funny to me to have been writing songs all this time, but just now reach the point of doing this. Note to self: you can always access beginners mind and be a rookie at any age. It’s liberating. And that brings us up to date. I have tons of songs, written and co-written, for which no recorded versions exist. I’m chipping away at recording the backlog, while writing new material all the time. And I’m co-writing again with my friend Greg, my first collaborator from way back at the start. A word on money: I have very talented and skilled friends who are willing to play and sing and design the visuals on my tracks for rates ranging from very reasonable to free. I deeply appreciate and value this, and want to make a point of acknowledging it here. Even so, in terms of economic priority, I can only afford to create a few new recordings at a time, so it is slow going as I’m populating my channel and seeking listeners. I hope to build more audience, to begin pitching some songs to be recorded by other people, maybe even to make a few dollars, someday. And even if I have zero success with my extrinsic goals, I’m okay with that. Exercising my craft and creativity in this way feels good. And when the songs are more personal — whether that’s celebrating the good stuff or making sense of life through writing about the hard stuff — that’s better than good; it’s an amazing feeling. As a friend says (hey George, I’m totally stealing the line you already stole): if you don’t want to be ripe and rotting, you’d better be green and growing. Stay tuned, y’all.